NEW GOLD OF THE INKAS. 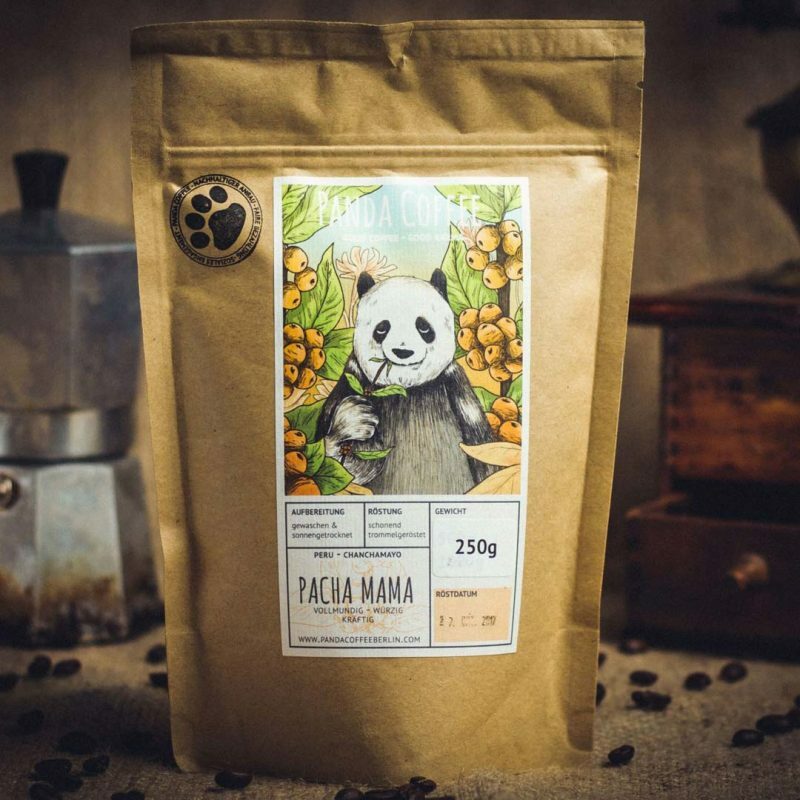 The Pacha Mama by Panda Coffee is more than just coffee. It stands for sustainable cultivation, traditional roasting and a fair remuneration along the value chain. Cultivation in the mixed forest guarantees an optimal ripening cycle, which ensures that each coffee bean can develop its fruity aroma. This is further supported by the gentle drum roasting – the result is a full-bodied specialty coffee, which tastes even without the addition of milk and sugar. And really good. The Pacha Mama has a taste quality that industrially roasted coffee can not achieve. The lack of maturity cycle, the harvest of raw or spoiled coffee beans and the too hot and at the same time too short roasting of industrially roasted coffee beats on the stomach. Not exactly how coffee enjoyment looks like. In addition, there is good karma included when drinking our Pacha Mama! Our coffee comes from the Peruvian highlands around the town of Miguel Grau in the Chanchamayo region. It consists of 100% finest Arabica beans of the varieties Caturra and Catuai, which are especially popular for the production of specialty coffees. The coffee beans ripen for ten months at an altitude of 1,320 to 1,720 meters in shade under trees. These conditions ensure a balanced ripening cycle and allow the Arabica bean to mature to a high-quality and full-bodied coffee. Moreover, unlike cultivation in monocultures, cultivation in mixed culture does not lack the soil. From June to July, the coffee cherries are picked by hand and then directly wet-cleaned in water-filled tubs. The bad fruits float up and are skimmed off, the good ones get into the pulper, which separates the fruity husk from the kernel, the bean. The pulp is collected in baskets, the coffee beans are put into another pool. There they stay for 36 hours until the beans have reached a humidity of about 10%. After that they are bedded on huge tarpaulins. Here they have to be turned every 2-3 hours to achieve uniform drying. The coffee from the Andean region is characterized by its pleasant sweetness, a fruity aroma and a fine acidity. The balanced ripening process and gentle drum roasting ensure that the natural flavors of the coffee bean develop and that in the best possible way. The jury described the Pacha Mama as a coffee with lots of sweetness, flavors of milk chocolate, hazelnut and almonds as well as a slightly fruity note. Our fine-aromatic coffee also convinces because it is creamy and pleasantly powerful at the same time – without leaving a bitter or sour aftertaste.